NEW YORK CITY RAIN BARREL GIVEAWAYS: New dates and locations will be added as information becomes available. Check back often or JOIN OUR WAITLIST to be notified when new sales are announced. Please do not join the waitlist if you have already received an email from us. We will notify you of updates. 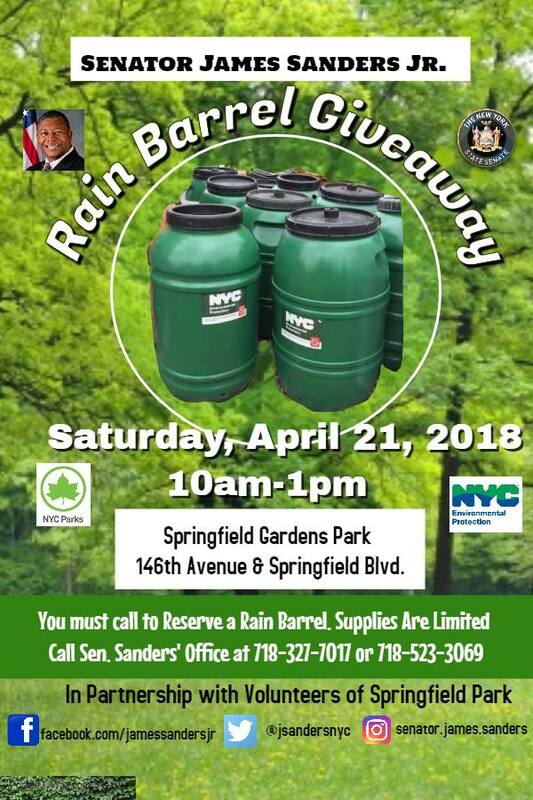 Senator Comrie, Assemblywoman Hyndman, and Councilman Miller are partnering with NYC DEP to host a rain barrel giveaway. Call (718)-765-6359 for more information - One barrel per individual and per household. Reserved barrels will be held until 9AM. First come first serve after 9AM. 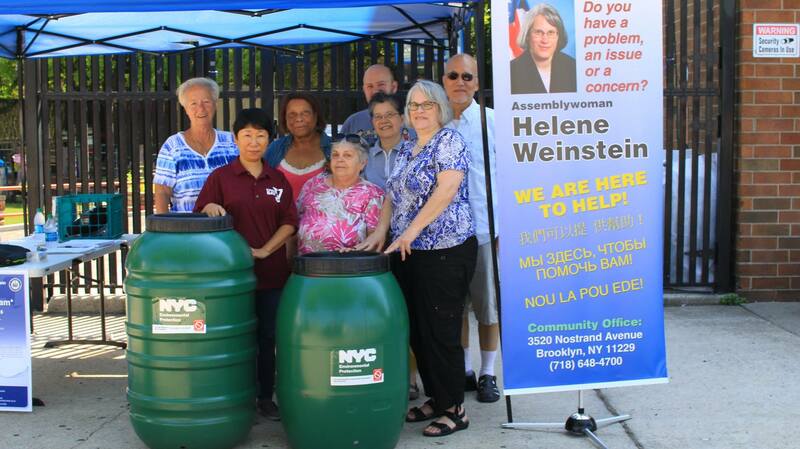 Please pick up your rain barrels at Roy Wilkins Recreation Center: 177th Street & Baisley Blvd. Jamaica, NY. We are giving away FREE Rain Barrels which can be used to capture storm water from your roof and store it for future uses like watering lawns or gardens. 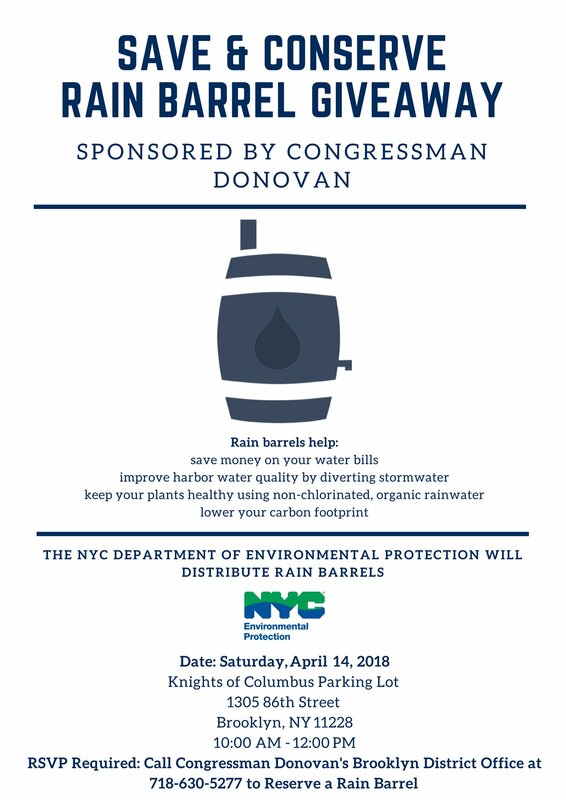 You must RSVP to reserve a rain barrel by calling 718-327-7017. Reserved barrels can be picked-up only between 8:30 AM and 9 AM; after 9 AM first come, first served. One rain barrel per household, all parties must be present for distribution, and photo ID may be requested at pick-up. Expect more giveaway dates at a later time. Please call Senator Comrie’s office at (718) 765-6359 to reserve a rain barrel for pick up. 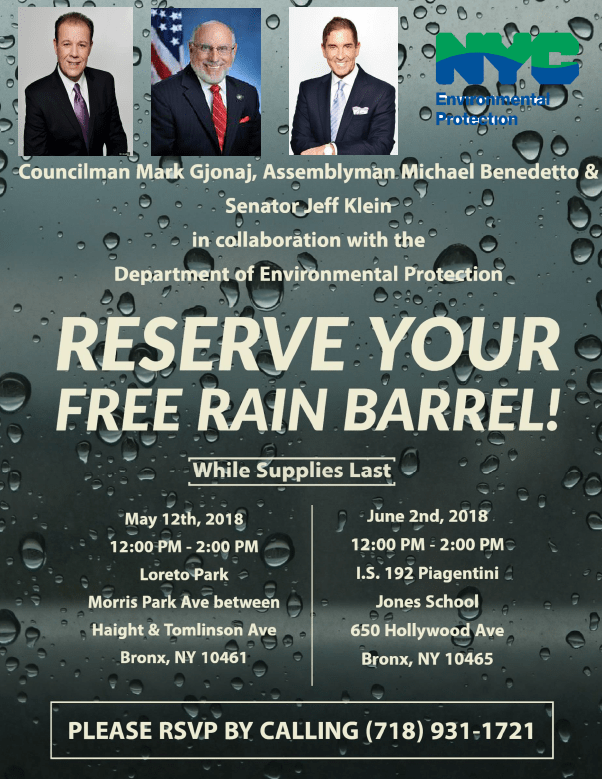 State Senator Joseph P. Addabbo, Jr., Assemblyman Brian Barnwell, and City Councilman Bob Holden are teaming up to bring a free rain barrel giveaway. Register to pick up your free rain barrel between 10 a.m. and 1 p.m. on Saturday, May 5 at Maspeth Federal Saving Bank, located at 56-18 69th Street in Maspeth. 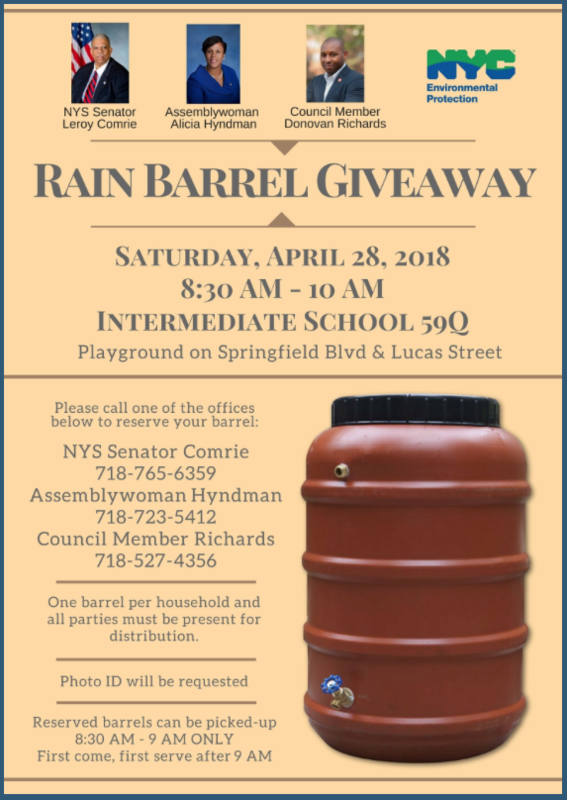 Those who pre-register must pick up their rain barrels between 10 a.m. and 12 p.m. Any remaining barrels will be given away on a first-come, first-serve basis. 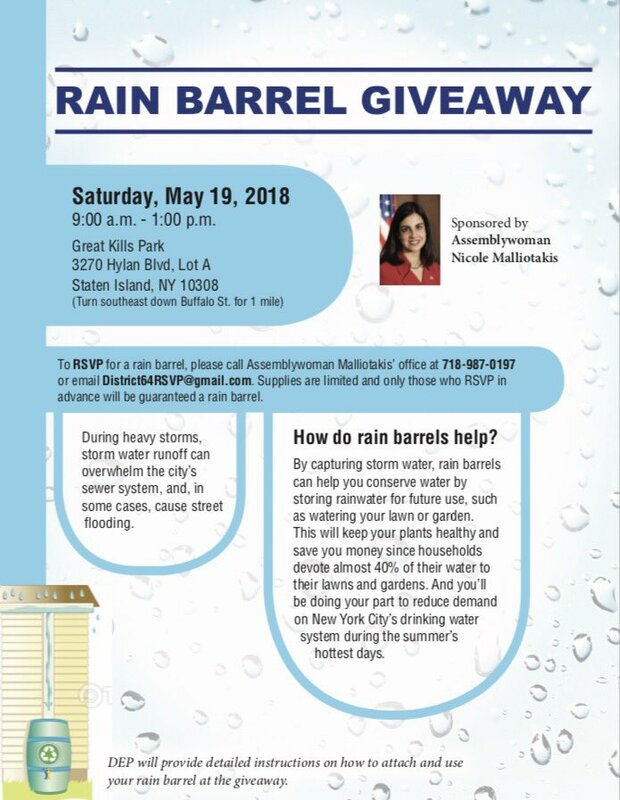 To register to receive a rain barrel on May 5, contact either Addabbo’s Howard Beach office at 718-738-1111, Barnwell’s office at 718-651-3185, or Holden’s office at 718-366-3900, or visit https://www.nysenate.gov/questionnaires/joseph-p-addabbo-jr/free-rain-barrel-give-away-may-5-2018. 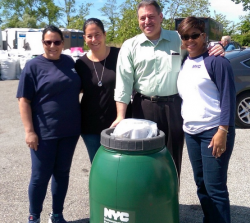 Addabbo is scheduled to collaborate with other elected officials to host additional rain barrel giveaways across his district. To find out more about these events, contact Addabbo’s Howard Beach office at 718-738-1111. Flushing residents can reserve their own rain barrel at this giveaway event next month. 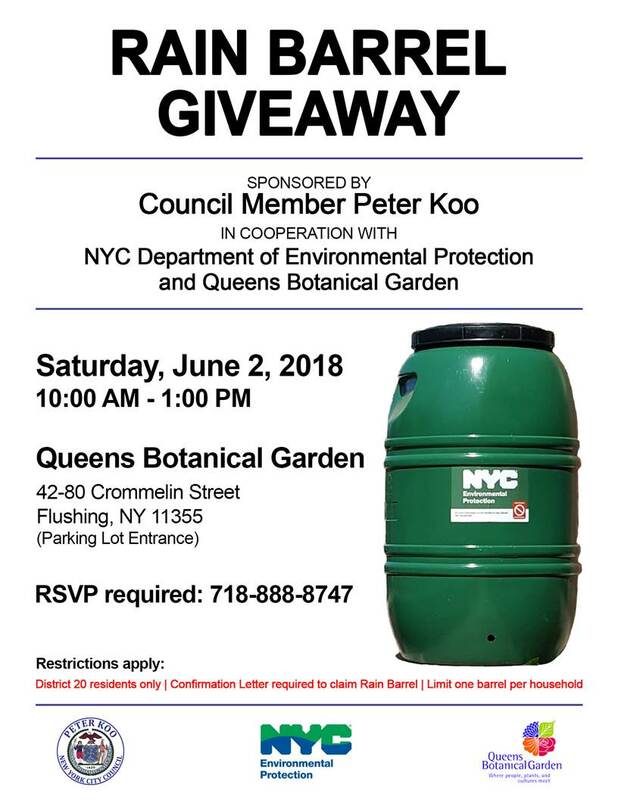 Councilman Peter Koo is teaming up with the Queens Botanical Garden and Department of Environmental Protection to host a rain barrel giveaway for residents in Council District 20. The giveaway will be handing out 250 rain barrels by reservation only. To reserve a barrel, call Koo’s office at 718-888-8747. Residents who reserve a barrel will receive a confirmation letter in the mail that they must bring with them to the giveaway. 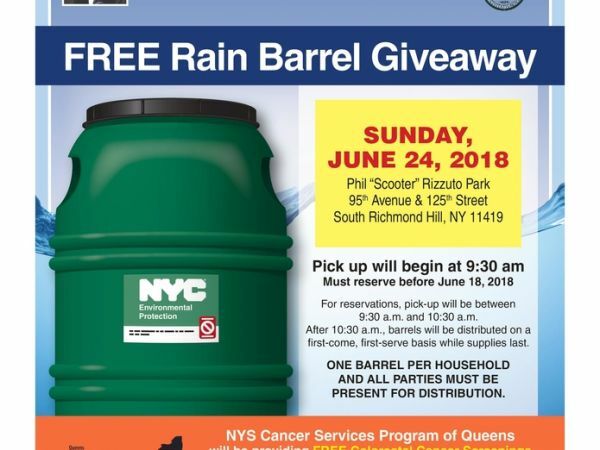 Barrels will be handed out on June 2 from 10 a.m. to 1 p.m. at the Queens Botanical Garden. 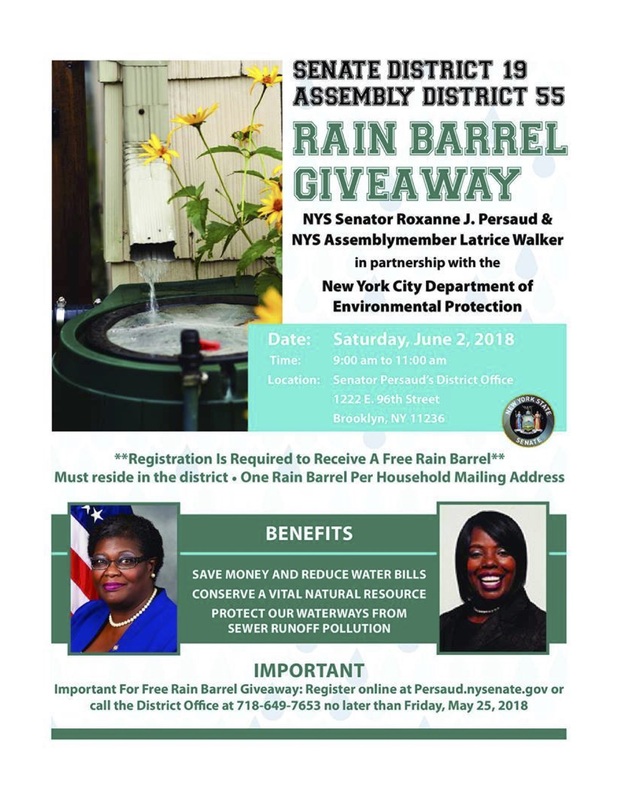 Senator Persaud and Assembly Member Walker are partnering with New York City Department of Environmental Protection to offer free rain barrels to homeowners to help reduce water bills, conserve drinking water, and help prevent hazardous sewer overflow into our local waterways. Rain barrels store captured stormwater for your future use, such as watering your garden or washing your car. To receive a free rain barrel register online at persaud.nysenate.gov or call the District Office at 718-649-7653 no later than March 16, 2018. 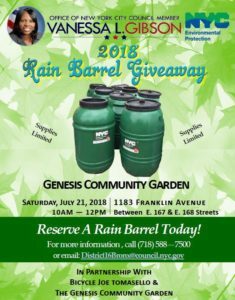 RAIN BARREL GIVEAWAY - Sponsored by NYC DEP and Council Member Vincent Gentile - The Rain Barrel Giveaway Program is an important part of our citywide green infrastructure initiative to create a greener more sustainable city. Rain barrel use improves NYC waterways by using natural systems to manage runoff during rainstorms. Homeowners can use rainwater collected in barrels for yard planting and other uses. Please contact the District Office by email at bk10@cb.nyc.gov or phone 718-745-6827. 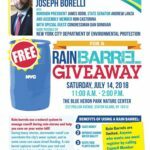 In partnership with the New York City Department of Environmental Protection (DEP), Senator Joseph P. Addabbo, Jr. will hold a rain barrel give away in Howard Beach. 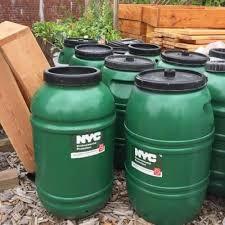 On Saturday, June 9, Addabbo will join DEP in giving away 55-gallon rain barrels to residents of his 15th Senate District at New York Families for Autistic Children (NYFAC), located at 164-14 Cross Bay Boulevard. Rain barrels are designed to help catch excess rain water, which can later be reused for simple household tasks, such as watering plants or washing cars. Reserved barrels can be picked-up only between 8:30 AM and 9 AM; after 9 AM first come, first served.One rain barrel per household, all parties must be present for distribution, and photo ID may be requested at pick-up. Please call Senator Comrie’s office at (718) 765-6359 to reserve a rain barrel for pick up. 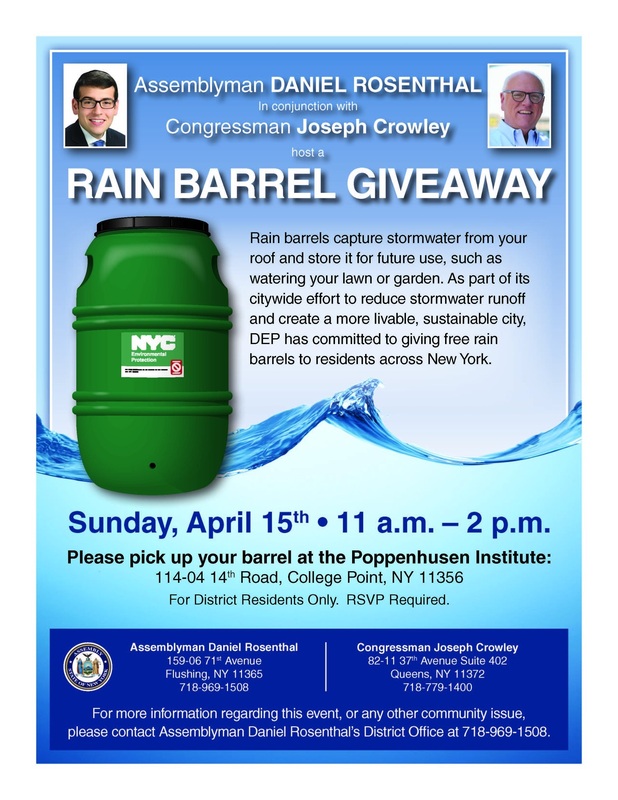 STATEN ISLAND, NY -- On Saturday, June 16, the City Department of Environmental Protection (DEP) will join Rep. Daniel Donovan in distributing free rain barrels to homeowners on Staten Island. The 60-gallon rain barrels are easy to install and connect directly to a property owner's downspout to capture and store the storm water that falls on rooftops. The water collected in the rain barrel can then be used to water lawns and gardens, or for other outdoor chores. 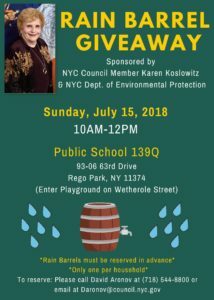 Saturday, June 16th, from 10am to 12pm, Rep Cusick's office will be co-sponsoring a rain barrel giveaway alongside N Y City Environmental Protection Dept. 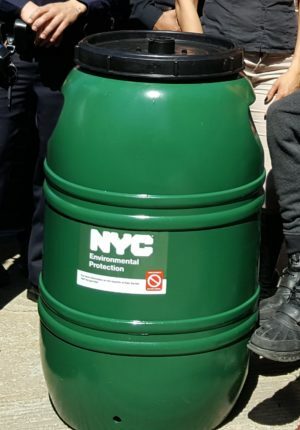 DEP’s Rain Barrel Giveaway Program is part of New York City’s Green Infrastructure Plan that aims to capture storm water before it can ever enter the sewer system and thereby reduce combined sewer overflows into local waterways. The event will occur at the College of Staten Island parking lot 4. 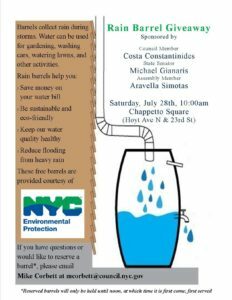 If you are interested in receiving a FREE rain barrel, you must RSVP at cusckrsvp@gmail.com or call 718-370-1384. Assemblywoman Helene Weinstein. 3520 Nostrand Avenue, Brooklyn, NY 11229. (718) 648-4700. Contact Assembly Member Weprin or Council Member Adrienne Adams for the June 24th giveaway at Phil Rizzuto Park at the intersection of 95th Avenue and 125th Street in Richmond Hill from 9:30am-11:00am. June 30th brought to you by Council Member S. Matteo at college of Staten Island. 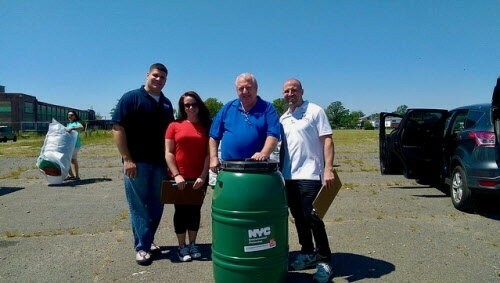 See http://www.statenislandnycliving.com/rain-barrel-giveaway-program-summer-staten-island-2018/ for more details. 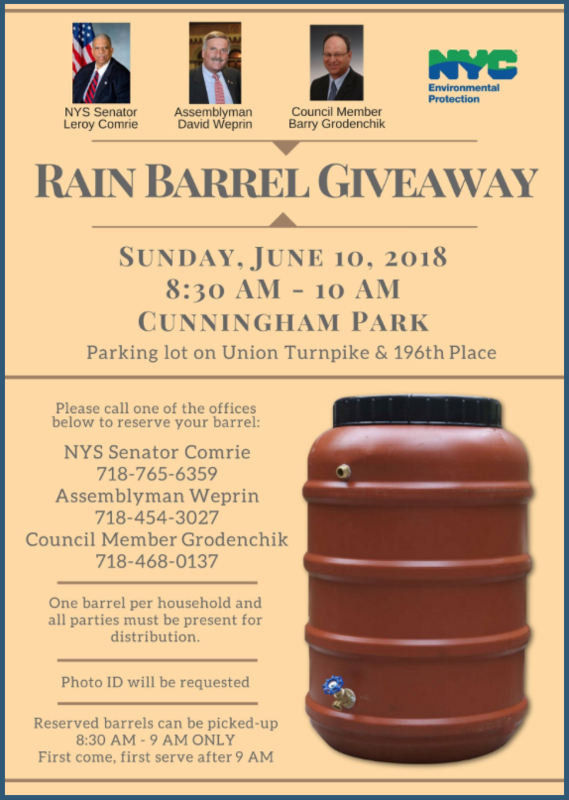 This summer, Assemblyman Ron Castarina is sponsoring a Rain Barrel Giveaway Event. 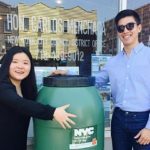 These rain barrels, courtesy of NYC DEP, aim to catch water before it enters the sewer system- thereby reducing sewer overflows. The 60-gallon rain barrels are easy to install and connect directly to your downspout to capture and store the stormwater that falls on the rooftop. The water collected in the rain barrel can then be used to water lawns and gardens, or for other outdoor chores. 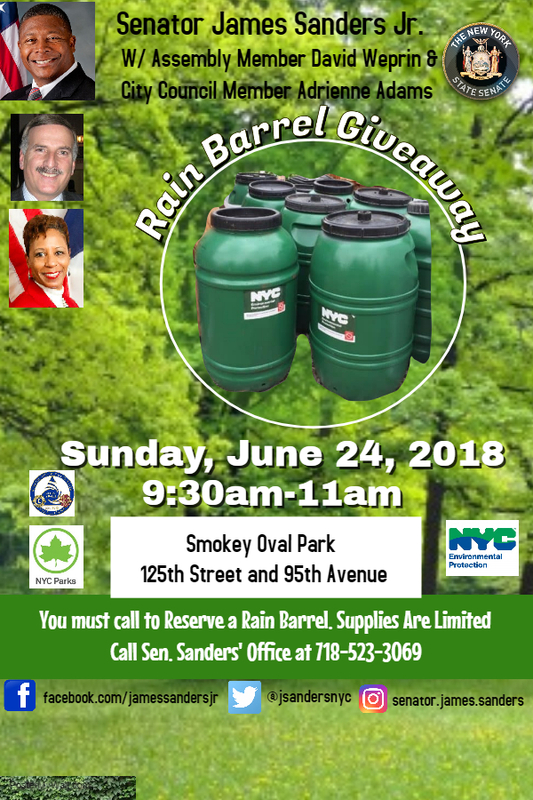 To reserve your rain barrel, please contact his office at 718-967-5194. STATEN ISLAND -- It's that time of year again! Join us for our annual Rain Barrel Giveaway on Saturday, July 14, at Blue Heron Park. In order to receive a rain barrel, you MUST register in advance by contacting my office at (718) 984-5151. City Council 38; Honorable Carlos Menchaca: Quantities are limited, first come, first served: Please call (718) 439-9012 or email Ivalladares@council.nyc.gov to reserve one. Sorry no deliveries. Barrels are available for pick up at district office: 4417 4th Avenue, Sunset Park. They come with everything you need for self-service installation at a rain spout in your yard. Costa Constantinides and Senator Michael Gianaris and Assemblywoman Aravella Simotas at Chappetto Square (Hoyt Avenue and 23rd Street) on Saturday, July 28th. To RSVP, email mcorbett@council.nyc.gov by Monday, July 23rd. Reserved barrels will only be held until noon, at which point they’ll be given on a first come, first serve basis.